Consciousness Conversations with Doctor on THE PLATFORM, Mmatheo Motsisi. Conscious Conversations with hosts Babalwa Manuel, The Duke -Tshepo and Zelo encourages you to go deeper into Consciousness and unlock the Power that lies within. To dwell in the present and be authentic amidst hectic daily life! It unravels the mystery that underlies our journey on this physical plane as spiritual beings. We are multidimensional beings made of energy coded with information on a brief earthly transit for the fulfillment of a Divine Mission. 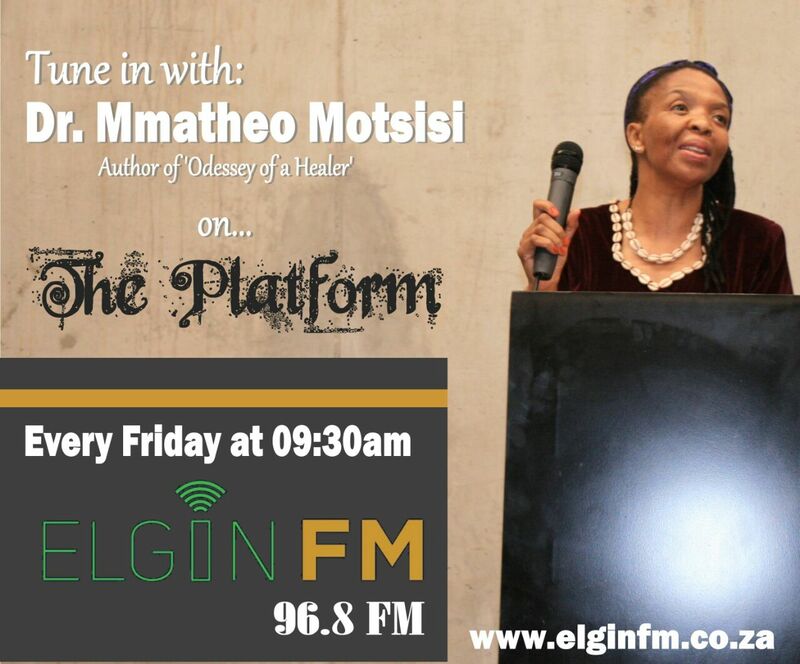 Listen to our conversation with *Dr. Mmatheo Motsisi*, the Author of Odyssey of a Healer that is based of her spiritual pilgrimage in search for “TRUTH” AND PURPOSE of incarnation into this physical plane. We’re all born or enter this earth plane with a given mission to fulfil. The soul chooses a vessel for operational purposes just like a driver chooses a car. The physical body is the required matrix through which the soul expresses itself….We are spiritual beings having an experience in a physical body, and not the other way round. It is an illusion to believe that the soul needs the physical body for its existence. The soul flows from the Supreme Source, it only chooses an appropriate matrix for its expression in form and fulfilment of its mission as it continues on its upward journey of progression. The body is just a chariot which the soul rides. Its senses, namely, sight, sound, smell, taste are wild horses that pull the body in many different directions. Identifying only with these senses and the perishable body is self-limiting and results in the loss of authenticity that defines us as a multi-dimensional being..
Dr Mmatheo Motsisi holds a Certificate in Traditional Chinese Medicine (TCM) & Acupuncture from China Academy of Traditional Chinese Medicine, completed her internship at Guang Men Hospital in Beijing. She graduated with BSc Physiotherapy at University of KwaZulu-Natal. Studied Theology, Integrative Healthcare & Spirituality with Holos University in Missouri (USA), Colon Hydrotherapy with RICTAT approved Colon Hydrotherapy Training College. Published Author of the Book: Odyssey of a Healer. Main Specialties: Integrative Healthcare, Spirituality, Physiotherapy, Chinese Medicine, Acupuncture & Colon Hydrotherapy. Dr Mmatheo Motsisi holds a Certificate in Traditional Chinese Medicine (TCM) & Acupuncture from China Academy of Traditional Chinese Medicine post completion of her internship at Guang Men Hospital in Beijing. Bachelor of Science in Physiotherapy from University of KwaZulu-Natal, South Africa. Masters of Theology in Pastoral Integrative Healthcare from Holos Graduate Seminary University in Missouri, USA. Diploma in Colon Hydrotherapy approved by GPACT & RICTAT.